Rare Bird Books, 9780998314792, 24pp. 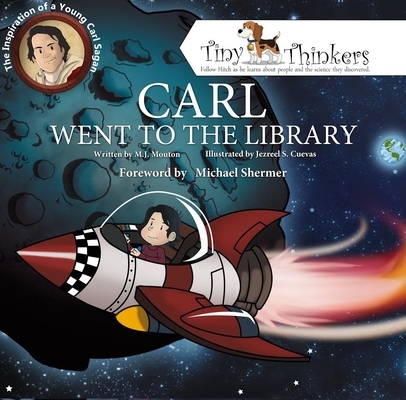 Blast off with Carl as he embarks on a curious journey. An adventure to find the answer to a question that no one seems to be able to give him an answer to. Encouraged by his mother, Carl's mission takes him to a wonderful place where imagination can run rampant and answers can be found. Destination--The Public Library He finds the answer he is looking for and more in this creative and extraordinary tale based on actual events in the life of Carl Sagan. MJ Mouton grew up in the small town of Iowa, Louisiana. After school, he went to work in the environmental field and developed a love for the science that was present in his job. There were so many amazing things about the Earth that he had not realized, or was not inspired to know as a student in school. Realizing these things, he became passionate, not only about Geology, Biology, and the physical nature of things, but also sharing what he had learned. As the father of two girls and a lover of all things scientific, MJ decided to write short stories to teach his daughters science basics, and hopefully give them the inspiration that he missed out on that young in life. He created over 40 stories that highlight scientists and the world-changing discoveries that they made, including Charlie and the Tortoise. MJ shares his time between the area he grew up and Chicago. Jezreel Cuevas was born in Orizaba, Mexico and currently lives in Veracruz, Mexico. Jez is a graduate of Universidad del Golfo de Mexico with degrees in Visual Communication and Graphic Design. He is an avid gamer, lover of comics, and cats. Jez often merges his passions to create original digital art paintings. Jez has a love for science and a desire to share that love with the world. After meeting M.J. Mouton online, and sharing his concepts, He and M.J. developed a friendship that makes working on books fun. Jez freelances his skills, making game icons, and commissioned works.